It was scarcely two years ago that that the world turned its attention toward Pizza Rat, the humble, ambitious, relatable NYC rodent that, like each and every one of us, was merely doing whatever it could to remain alive long enough to eat its next slice of pizza. Of course, Pizza Rat eventually abandoned its effort, scurrying beneath a staircase and leaving the pizza to be smashed by uncaring pedestrians into the floor, and yet the ambition of little Pizza Rat remained not just commendable but inspirational. We should all reach for the pizza slice too large for us to carry; we should all dream so big as to drag that slice down the steps to our subterranean lairs where we might find a piss-free corner to eat it. 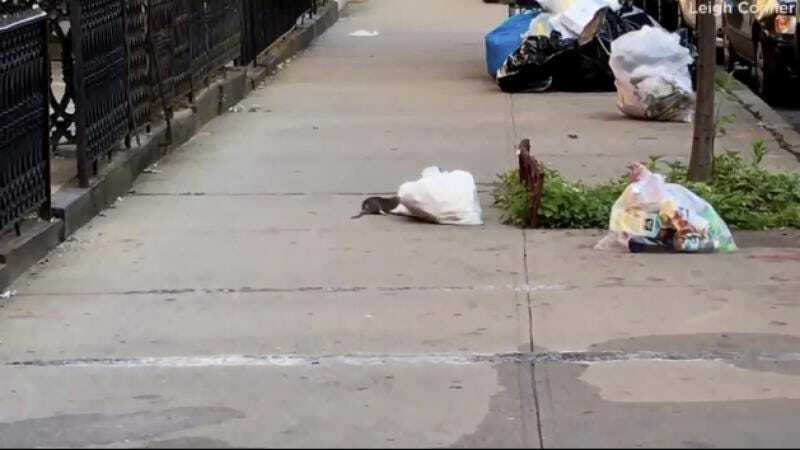 Yesterday, another rat—or is it the same rat?—was filmed dragging a whole goddamn sack of trash toward its home. The rat ultimately frees some piece of refuse—it looks like some sort of weird, flat cake that is not a pancake—and flees through the neighborhood. The camera then zeroes in on the hole through which it escaped, where the foodstuff remains. Did Trash Bag Rat abandon it? Is it beneath the food, nibbling on it? Is Trash Bag Rat a sadder version of Pizza Rat, or is it more relatable? Have we, collectively as a culture, lowered our dreams from pizza to trash bags full of incomprehensible foods? The owner of the home the rat scurried beneath told ABC 7 that he patched up the hole on Monday morning, seemingly sealing the rat’s fate, at least until 2019, when a similar rat goes viral for dragging a rat corpse toward a pile of other rat corpses, earning the nickname Rat Corpse Pile Rat and somehow evoking the psychological torpor of President Orrin Hatch’s America.